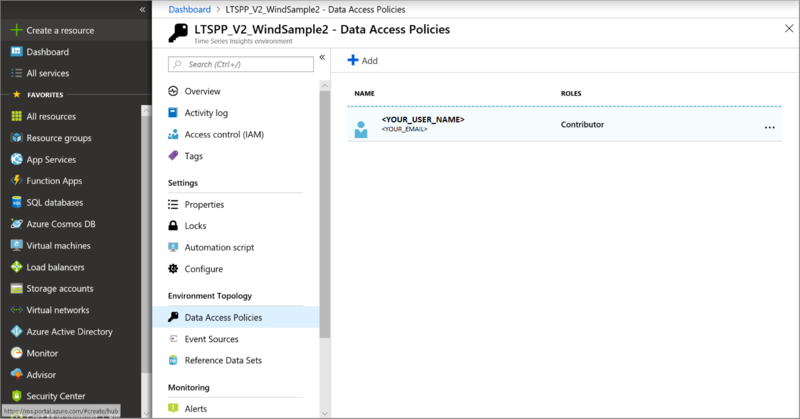 This article discusses the two types of Azure Time Series Insights Preview access policies. Follow these steps to grant data access for a user principal. Locate your Time Series Insights environment. Enter Time Series in the Search box. Select Time Series Environment in the search results. Select your Time Series Insights environment from the list. Select Data Access Policies, and then select + Add. Choose Select user. Search for the user name or email address to locate the user you want to add. Click Select to confirm the selection. Select Contributor if you want to allow the user to change reference data and share saved queries and perspectives with other users of the environment. Otherwise, select Reader to allow the user to query data in the environment and save personal, not shared, queries in the environment. Select OK to confirm the role choice. Select OK on the Select User Role page. Confirm that the Data Access Policies page lists the users and the roles for each user. Guest isn’t a management role. It’s a term used for an account that’s invited from one tenant to another. After the guest account is invited into the tenant’s directory, it can have the same access control applied to it like any other account. You can grant management access to a Time Series Insights Environment by using the Access Control (IAM) blade. Or you can grant access to the data in the environment through the Data Access Policies blade. For more information on Azure Active Directory (Azure AD) tenant guest access, read Add Azure Active Directory B2B collaboration users in the Azure portal. 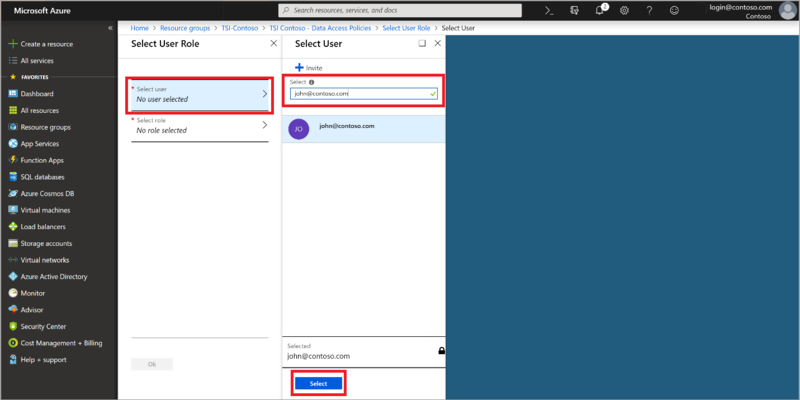 Follow these steps to grant guest access to a Time Series Insights environment to an Azure AD user from another tenant. Select Data Access Policies, and then select + Invite. Enter the email address for the user you want to invite. 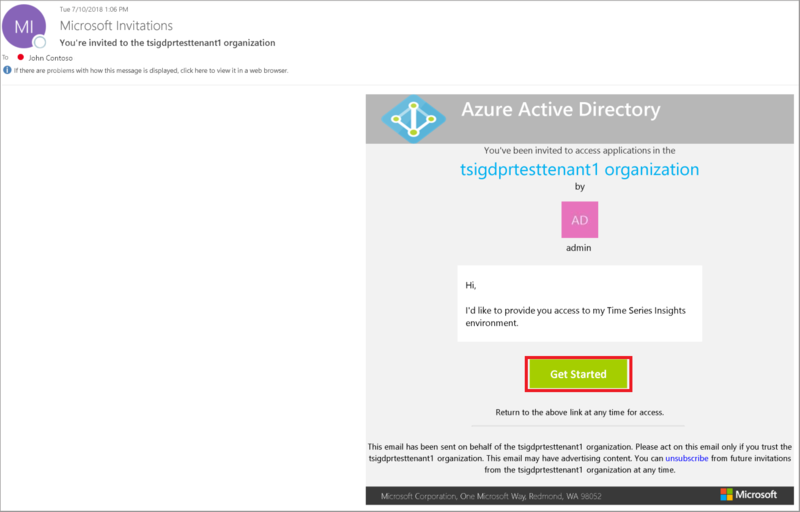 This email address must be associated with Azure AD. You can optionally include a personal message with the invitation. Look for the confirmation bubble that appears on the screen. Choose Select user. Search for the email address of the guest user you invited to locate the user you want to add. Click Select to confirm the selection. Confirm that the Data Access Policies page lists the guest user and the roles for each guest user. Now the guest user must follow steps to access the environment located in the Azure tenant to which you invited them. First, they accept the invitation you sent them. This invitation is sent via email to the email address you used in step 5. They select Get Started to accept. 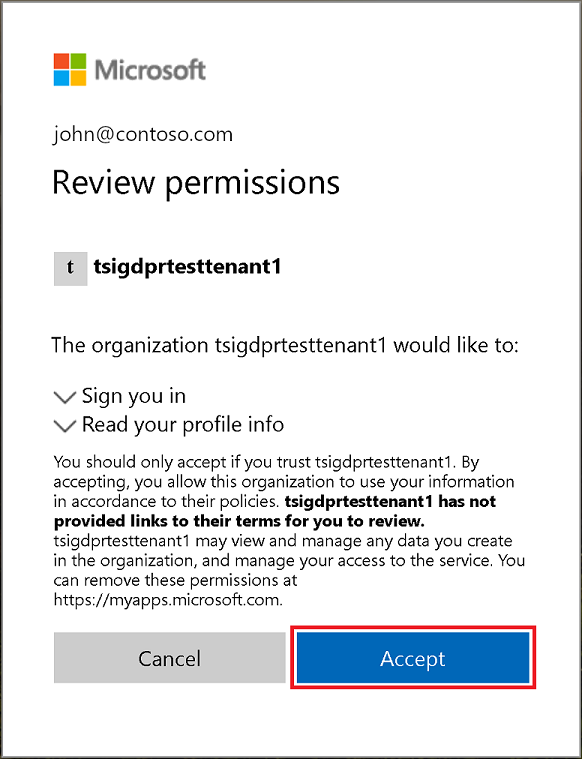 Next, the guest user accepts the permissions associated with the admin's organization. 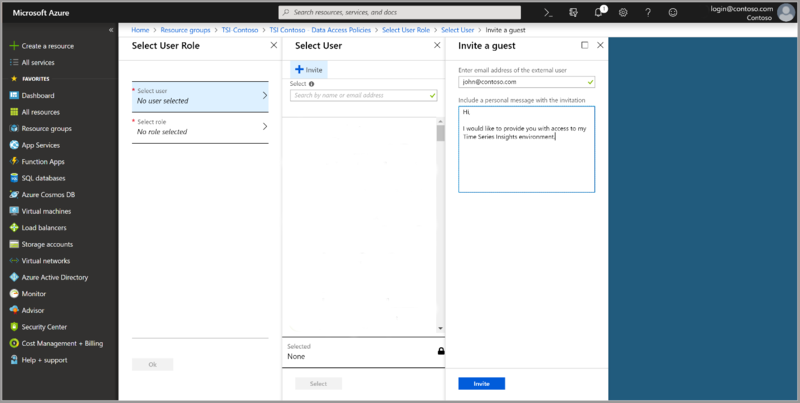 After the guest user is signed in to the email address you used to invite them, and they accept the invitation, they go to insights.azure.com. Once there, they select the avatar next to their email address in the upper-right corner of the screen. Next, the guest user selects your Azure tenant from the directory drop-down menu. This tenant is the one to which you invited them. After the guest user selects your tenant, they see the Time Series Insights environment to which you provided them access. They now have all the capabilities associated with the role that you provided them with in step 8. Learn how to add an Azure Event Hubs event source to your Time Series Insights environment. Send events to the event source. View your environment in the Time Series Insights Preview explorer.